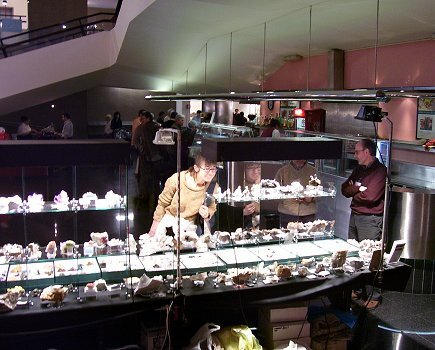 My initial impression is that the show is about 75% minerals being offered and about 20% shells and fossils and about 5% gemstones. These are not precise numbers but only a sense of what I have about what is here. What is totally impressive is that the show is 100% NON SMOKING! This is something we've noticed at all the restaurants also. Italy seems to have broken out from the pack when it comes to public health issues related to smoking! 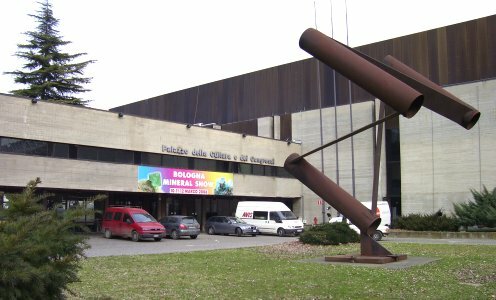 The main entrance to the Bologna Show. 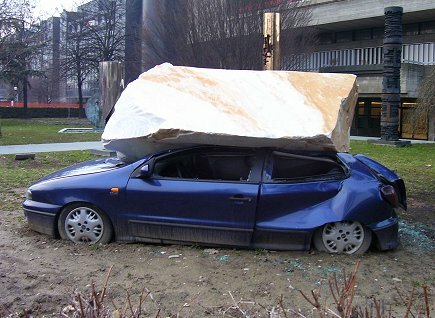 the life of a London skip hire business would tend to be, if this is any indication. 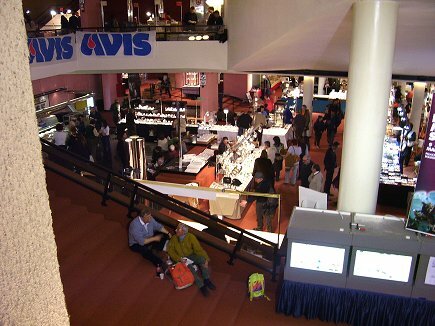 The high end dealers are typically found in the lobby area of the Convention Center. show area which extends in many directions from this area. Another shot of the lobby area from one of the many staircases. 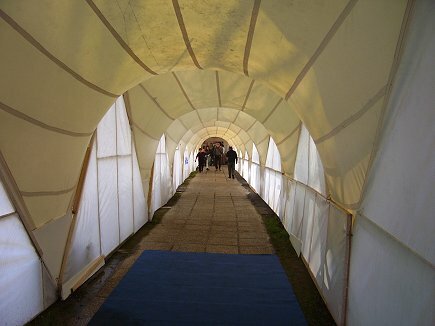 enter a large tent area with another 50-60 dealers. 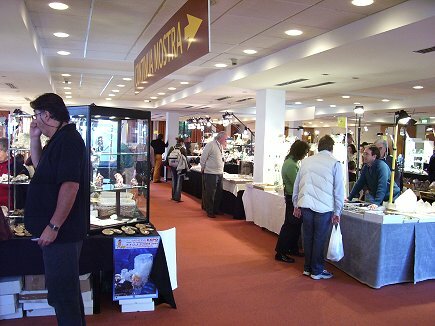 There are also a number of dealers set up on the 2nd level above the lobby. So there is a lot to see here. 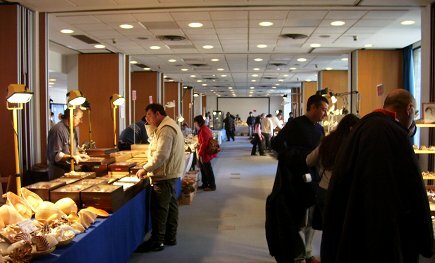 I recognize many of the dealers from either Tucson, Sainte Marie or Munich but there are a great many Italian dealers here and many more from eastern Europe that do not set up at any other show venue that I am aware of so there are opportunities to find minerals that you never see at places like Tucson or Munich. 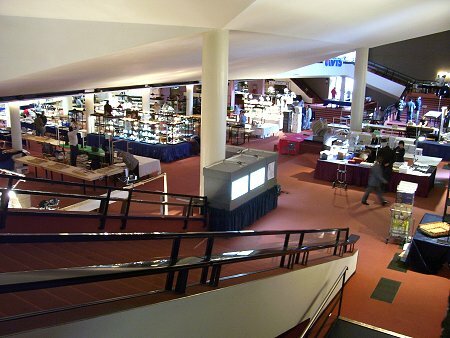 Situated on one of the stairways was Italian dealer Giuseppe Agozzino. 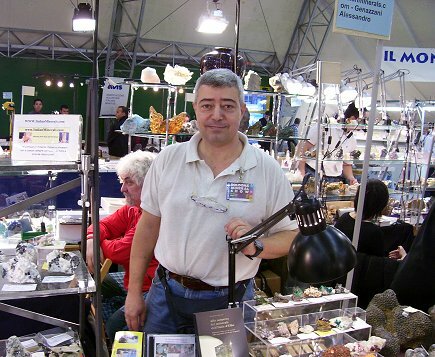 Giuseppe had some self collected specimens of fluorite from Sicily available and also had a fine display of his personally collected Italian collection that were not for sale. He did, however, have a large specimen of lepidolite with scattered bluish green microlite crystals in excess of 1 cm across that I could not pass up on from the Naipa Mine in Alto Ligonia, Mozambique. 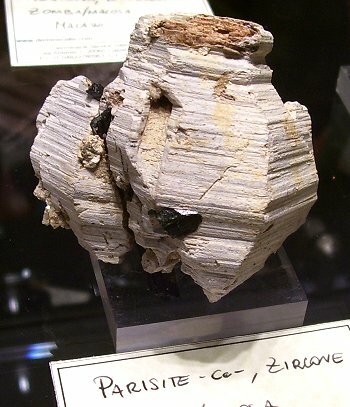 This mineral was recently presented as fluoronatromicrolite however there has been some controversy about that so they are "just" microlite. There are variations reported from Naipa including stibiomicrolite. Regardless, these are enormous and well formed microlite crystals with a rich green color. This specimen will get worked on when I get back home as it has the possibility to become several. Here is a shot of Giuseppe wrapping up my microlite specimen. 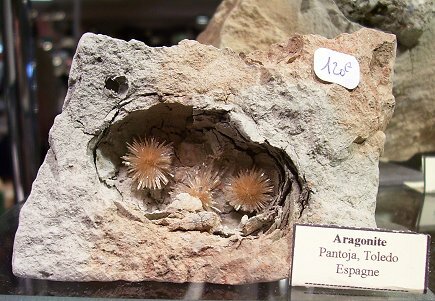 Giuseppe had specimens from his personal collection (all field collected by himself) from Italy. This specimen of elongated grossular from Piemonte was exceptional. A gem crystal! 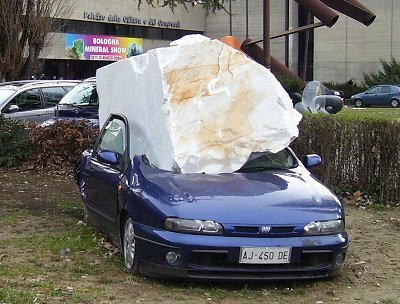 Italian dealer Corrado Vietti had about 15 specimen of fluorite with or without calcite and quartz, from San Martin, Zacatecas, Mexico. 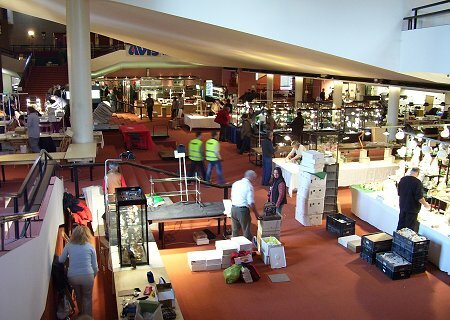 I have not seen specimens of this quality from there in a number of years so it was quite surprising for me and it was one of my first good opportunities for something at the show. 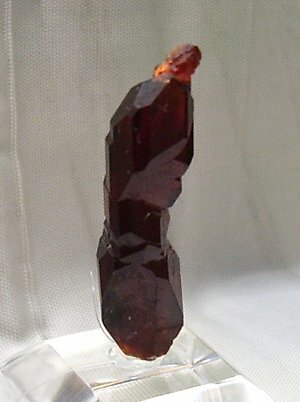 This is a typical piece he had available with crystals to about 2 cm across. 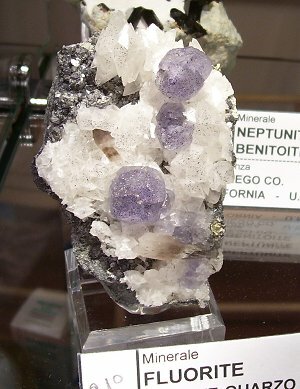 benitoite and neptunite to San Diego County instead of San Benito County. This is one of several specimens I obtained and photo'd in the bathroom at my hotel. 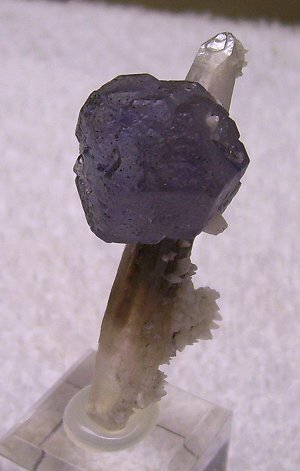 dodecahedral crystal of fluorite about 2 cm across. A killer miniature from this locality! 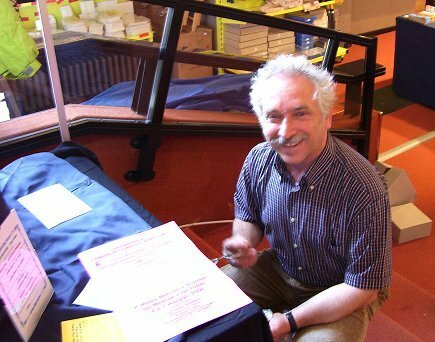 Here is a shot of Corrado while preparing my selected specimens. J.J. Cailloux-Abello had the best pieces that I saw. These are fluorescent green under UV light also. I did not purchase any due to their fragility. old timer specimen of wulfenite from Los Lamentos from Massimo. I saw Emanuele Marini (Demineralia.com) and his mother Eina, who is equally enthusiastic about minerals, in the lobby area with some exceptional specimens on display including this gorgeous demantoid from Val Malvenco, Italy. 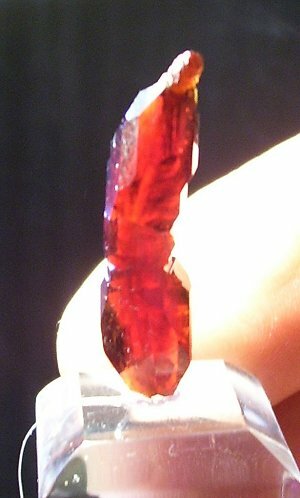 Crystals to 2 cm across of gem quality which was sold already. Emanuele also had a fine group of specimens from Malawi including an enormous parisite specimen pictured below. 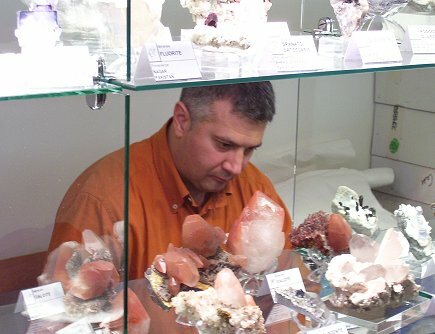 Emanuele has requested to join the group who offer minerals at Mineral-Auctions.Com and will be doing so in May most likely. I picked out several specimens of violet fluorite from a northern Italian locality and also a specimen of the "stretched" grossular of near gem quality in Emanuele's stock. These will be posted in an April update later in the spring. 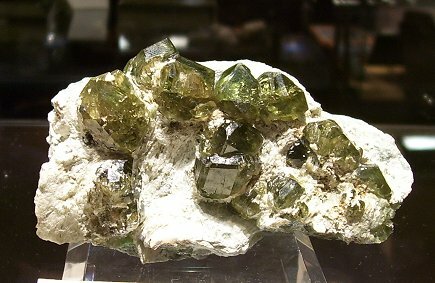 This demantoid specimen is about 7-8 cm across from Val Malvenco. This is a 4 cm wide crystal of parisite from Mt. Malosa in Malawi. Recall that at Tucson there was a new find of Romanian realgar presented by several dealers including Chris Wright and Luiz Miguel Fernandez. I initially voiced some skepticism about these due to their peculiar appearance. 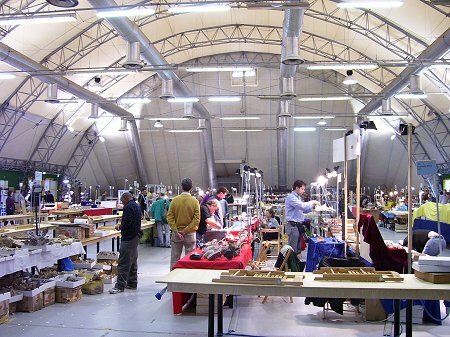 Well there are hundreds or even thousands of these here in Bologna with many eastern European dealers being the primary handlers. About half have stibnite associations. There is absolutely no doubt of their being genuine now. I am avoiding these, however, due to the sulfide rich matrix which will likely impact these in a relatively short time. Still they are quite striking. 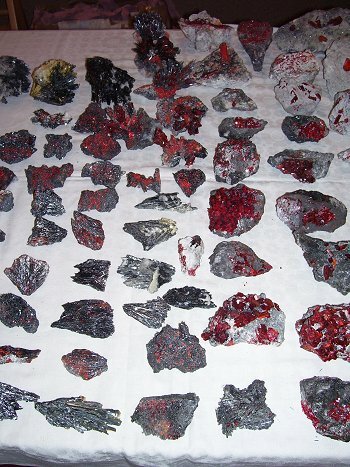 This is a small hoard of the realgar specimens available here in Bologna. Seating is at a premium here as after a long day of perusing the booths it helps to rest one's feet. The myriad steps in the convention center offer a suitable substitute for sure. 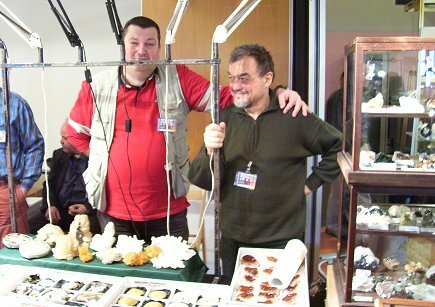 Here is a back view of the Webminerals.Com booth area with Giuseppe (far right) in conversation with a collector. his wife, Ombretta's, generosity and hospitality during our stay here in Italy for the next 2 weeks. If you are interested in a copy of the book it is five euros or about seven bucks. You can contact him at Italianminerals.com or here. More in the next installment from Bologna including images from the displays and images of some specimens I found here.